OK. I’ve been holding off on this one for a fair while, partly because I am obviously not a disinterested party. But now that Frank Farina has put in his typically unhelpful and undignified two cents’ worth, it’s time to dispel a few myths. Let’s clear the ground first. Yes, deducting points once the finals series is underway would be a farcical punishment and cause for considerable suspicion. Yes, Frank Lowy’s position as both FFA chairman and majority shareholder of Sydney FC (if only by proxy) is an obvious and very worrying conflict of interest. Incidentally, many Sydney FC fans are among the worried ones on that last point. But there are a couple of things that need to be cleared up. Or rather, a couple of convenient myths that need to be debunked. Myth No. 1: Sydney FC has already been found guilty a second time. Nothing has been determined as yet. Whether the investigations have been deliberately delayed until the finals series may still be a matter for speculation, but it is wrong to imply (as Farina does) that the matter is already settled and that the FFA is merely stalling over the punishment. Myth No. 2: Sydney FC is a repeat offender. You have a club that has blatantly breached the cap, not once but twice. Implication: that, after being let off lightly in August this year, Sydney FC have gone and dunnit again. After three months of investigations, FFA is now prepared to act. Should the governing body decide any breaches warrant stronger action, Sydney could lose more than one point. "Yes, there are on-going investigations into salary cap breaches in season 05/06 and, ideally, we'd like to make a ruling before Christmas," said A-League head of operations Matt Carroll. That’s right: the investigations relate to last season. In other words, George Perry et al. would have had to travel back in time in order to “re-offend”. And just on a small related matter, the previous CEO Tim Parker does not deserve the criticism that has come his way, given that the contracts under investigation were drawn up before he even arrived at the club. Speaking as a fan, I’m prepared to accept any punishment the FFA deems suitable for Sydney FC, and, should the points deduction be delayed until the finals series, I’ll admit that the whole situation is anomalous (to put it politely). But let’s keep things in perspective for the moment. More confusion on the squad requirement issue, thanks to David Lewis. Sydney has just over $100,000 at its disposal within next season's $1.7million salary cap, and it must recruit five more players to meet squad specifications for the coming Asian Champions League. 17 + 5 = 22, and a marquee player presumably makes 23. But is this enough? Let me remind Mr. Lewis that this competition ostensibly requires thirty players to be registered initially. Again: has there been a dispensation from the AFC in this matter, due to the relative youth of the A-League? If so, has this been officially announced? 'Tis all still a muddle. The draw for Asia’s premier club competition has now been made, and the two Australian clubs face a predictably difficult task. Adelaide would appear to be in marginally the tougher group, with Chinese club Shandong Luneng in tremendous form of late. Incidentally, while we are entitled to expect our national team to reach the latter stages of the Asian Cup, Sydney FC and Adelaide United will be underdogs in the AFC Champions’ League. No other Asian nation has as many top players in Europe as does Australia, and consequently the best club teams on the Asian mainland, as opposed to the A-League clubs, contain plenty of players of genuine international calibre. But that is surely the least of the worries afflicting George Perry and Michael Petrillo (not to mention Matt Carroll) at the moment. Aaron Timms of the Sydney Morning Herald outlined some of the problems facing the two Australian representatives in this piece, and next to nothing has been clarified since then. 1. Will Sydney and Adelaide be obliged to submit an initial list of thirty players, as the rules specify? Even with the expanded roster allowed next season, A-League teams will only be allowed a maximum of 23 players. Yet the Champions’ League rules are quite clear. Has there been a dispensation from the AFC? I’ve seen nothing to suggest this. Are all thirty players required to be contracted to the club, or is it merely a list of names? There seems to be no reason to assume the former, so perhaps this will make Sydney’s and Adelaide’s job easier. The only stated requirement is that none of the initial list of thirty should represent another team in the group stage of the competition. Would it be possible, for instance, to nominate a “targeted” list of state league players, who could be signed on loan to replace injured players in case of necessity? Sydney FC in particular face a torrid time straightening out their squad, with plenty of players off-contract at the end of the 2006/07 season. But that’s another issue. 2. What happens to the TV revenue? We’ve heard that any prizemoney gained through the competition will be distributed evenly among the eight A-League clubs. But the prizemoney on offer is fairly paltry, unless a club reaches the final (and, with all respect to Sydney and Adelaide, I don’t believe either is likely to do so). But will revenue accrued from AFC TV deals trickle down to the national associations, or to the individual clubs? Of what order is it likely to be? A completely frivolous and uncontroversial post, for once. 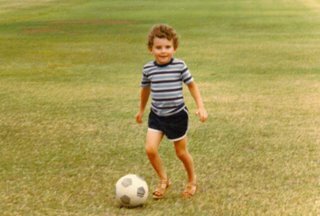 Your own Football Tragic circa 1978, inculcating a lifelong passion. 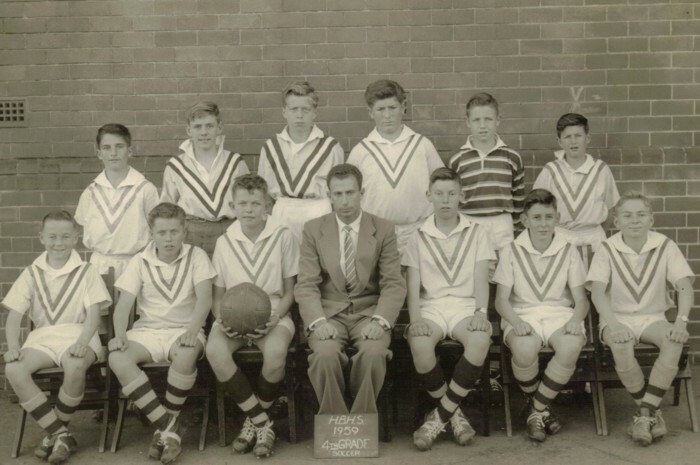 Homebush Boys' High 4th XI, 1959. 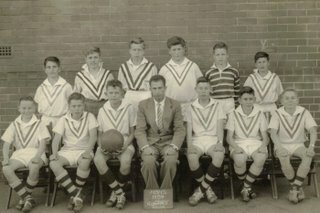 Father of the Football Tragic is extreme right, front row. Outside-left (left-winger, for those born after the war) was his position, he informs me proudly. But then...he's almost entirely right-footed, like me. Well, it’s the time of giving, they say. So let’s offer those gathered under the footballing holly what they really want…or need. For Frank Rijkaard: a striker. For Ronaldinho: a headband that does not require constant adjustment. For Arsene Wenger: Dennis Bergkamp changing his mind about retirement. For Javier Mascherano and Carlos Tevez: a one-way ticket, erm, anywhere. For Sepp Blatter: a photo opportunity involving Pele, Zinedine Zidane, Ronaldinho, a starving African child, and a trophy (doesn’t really matter which one). For Jack Warner: a brief pamphlet entitled Conflicts of Interest: A Beginner’s Guide. A copy will also be sent to Frank Lowy. For Danny Jordaan: a stadium or two. For Craig Foster: a ticket to an actual, live, game of football. For Ron Smith: a left-back. For Terry Butcher: a full-back capable of completing a successful pass. For Frank Farina: a striker who actually scores occasionally. For Matt Carroll: a dartboard with “New Zealand Knights” emblazoned across it. For Sean Sowerby: an old-fashioned “Press” hat, to be permanently attached. For Graham Arnold: the removal of the word “caretaker” from English dictionaries everywhere. Once again, as with the allocations for the original Asian Cup qualifying groups, we have been dealt a kind hand for the main competition next year. Potential banana skins like Saudi Arabia and Qatar have been avoided, and although we now face probably the strongest of the four host nations, Graham Arnold has good reason to feel pretty confident. Oman is one of the weaker Gulf nations, with a generally mediocre record in World Cup qualifying and other Asian competitions. In the recent Asian Games in Doha (in which football is an Under-23 competition, as at the Olympics), they finished third in their qualifying group behind China and...Iraq. I tend to think that Iraq could actually prove a greater stumbling block than the Thai hosts, in our Asian Cup group. Despite the chaos and ongoing slaughter in their country, Iraqi football is on the up, and their achievement in reaching the final of the Asian Games - they defeated South Korea in the semis - is fair warning. Of course, Australia has had difficulties against Iraq in the recent past. Missing their "overage" players, the Olyroos went out limply to Iraq in the quarter-finals of the Athens Olympics. In the subsequent friendly in March 2005 (a sweetener for our then-imminent Asia move), Frank Farina's senior side, at close to full strength, needed a well-taken late strike from Ahmad Elrich to overcome a dogged, compact team. Australia's poor performance in that fixture, incidentally, helped to precipitate the infamous Farina-Orsatti bust-up. Thailand are not to be underestimated, particularly at home in familiar conditions, but they are not quite at the level of the Asian powerhouses, or even the better Gulf nations, as yet. Topping an easy group at the Asian Games, they nevertheless went out with a whimper at the quarter-final stage, to eventual champions Qatar. Results in youth competitions are not always a good barometer, but our Under 20s had little trouble disposing of the Thais in the recent Asian Under 20 tournament in India, and in the earlier four-nation tournament in Malaysia. "We are going to be going into a totally different environment than the European culture, which most of the players are familiar with; we are going to go into very humid and hot conditions, and we've got to make sure our preparation is just as spot on as it was for the World Cup." Let us hope it will be. With the Christmas break upon us, now is as good a time as any to preview the run-up to the A-League finals. Last season, there was only one team clearly out of contention at this stage. This term, although Perth is still mathematically in the hunt, for all practical purposes their season is over. Glory fans have a right to be extremely dissatisfied with their team's limp showing against Sydney FC last Thursday, and to wonder why Ron Smith appeared to be approaching the game with such a defeatist attitude. About New Zealand, the less said the better. And so to the finals. First of all: congratulations Melbourne Victory on securing the minor premiership. Ernie Merrick's side have played neat, smart football throughout, with abundant penetration in the final third and a well-organised defence. Worthy winners of the league stage of the competition. How are the others shaping up? Much will depend, of course, on whether Sydney FC are to be hit with a point(s) deduction for their salary cap breaches. As things stand, they are unlikely to miss out on the final four; should two or three points be deducted, it could make a considerable difference. Of the five "contenders", the Mariners probably have the most favourable run-in. With three games at home, two of them against the wooden-spooners and the perhaps not-so-committed minor premiers, they should be able to add substantially to their tally. But will it be enough, with Newcastle running them neck-and-neck? The Jets have three home games left as well, and are playing some superb football at the moment. The loss at Hindmarsh was a considerable setback, but they should still have enough wind in their sails to put together a good run home, especially with Nick Carle yet to return. Both the Mariners and the Jets have been suffering from some uncertainty in defence lately; the Mariners are missing the experience of Tony Vidmar, while the Jets' use of Jade North in a central role is not without its problems, as Jason Spagnuolo ruthlessly demonstrated last Friday. Ante Covic, too, despite a couple of good saves late on, did not look remotely solid. For the Mariners, Mile Jedinak's suspension may just be a blessing in disguise, if it allows Tom Pondeljak to return to the advanced central midfield role in which he is surely most effective. Andre Gumprecht has been slowly gathering steam in the engine room, and should be at his peak for the final few weeks of the competition. It may just come down to goal difference between these two. I'll go with the Mariners, although it would be a great shame if Newcastle missed out on the finals, after providing such excellent entertainment this season. Although Queensland did well to beat the Mariners last week, with Dario Vidosic at last producing a performance to rival his game-turning half-hour in Round 1, I can't quite see them making the final four. They still look somewhat disjointed, and they have a tougher finish to the competition, with three games out of four away. Are Adelaide likely to suffer from a post-Romario slump, as Sydney FC did after the guest stint of Kazu last season? In my opinion, it isn't likely. Although John Kosmina has altered the team to fit Romario in, he will surely restore Nathan Burns to a striking role for the final few rounds. With Burns, Jason Spagnuolo and Greg Owens in fine touch, Adelaide look a menacing unit at present. In my view, they are likely to overtake Sydney and finish in second. Sydney's run home is the most hazardous. Three away trips to fellow "contenders" will have to be faced, and the likelihood is that they will lose at least one of them. In the interests of fairness, the FFA must surely resolve the matter of points deduction before the next round of games (as they have undertaken to do). If the FFA comes down hard on Sydney FC, they are, I feel, in serious danger of missing out on the final four. Full marks to Melbourne Victory fans for producing the apposite banners above, and to Kevin Muscat for producing a robust attack on the football refusers in the Melbourne media. For all those who scratched their heads over this article in this morning's Sun-Herald, my deepest sympathies. It's time for some background information. You see, in a galaxy far, far away from reality, there exists a Planet Foster. This planet glows alternately blue, orange and yellow (but never white or red, by a quirk of light), and has recently had its orbit altered somewhat by its larger neighbour, Planet Murray. Many strange things happen on Planet Foster. For one thing, draws against Laos magically turn into losses, and wins against the New Zealand Knights magically turn into draws. All salient points of modest significance (such as one particular club's refusal to consider a local coach in the interests of maintaining a flashy image) always get drowned in an ocean of knee-jerk rhetoric. Club managers on Planet Foster are expected to do far more than just get results. However, managers of national youth teams are hectored with the observation that their results tell everything. Teams playing with ten men for over an hour are expected to produce stunning, dazzling football on Planet Foster. I know, it's a bit odd. On this particular planet, national characteristics are viewed in terms of strict stereotypes. On Planet Foster, everything Dutch, French and Brazilian is necessarily wonderful. Everything with its origins in the British Isles comes equipped with horns and hooves (the inhabitants of Planet Foster are liberally supplied with garlic and wooden stakes in case they encounter any of these horrible monsters). Brazilians, Dutch and French freely spread their footballing wisdom (which is beyond question) all over the world, on Planet Foster. In a development apparently occasioned by gravitational forces emanating from Planet Murray, the nations of the former Yugoslavia have joined this conclave of the enlightened. Conversely, the nations of the British Isles simply do not export any of their coaches to anywhere other than Australia (the likes of Roy Hodgson, Peter Withe, Stuart Baxter, Steve Nicol and others are considered mythical beings on Planet Foster). You see, there are literally thousands of coaches in the aforementioned enlightened nations who are all better than anything the British Isles has to offer. Oh, and have I told you that, on Planet Foster, British football is simply a mishmash of hard tackles and fisticuffs? You might be forgiven for thinking that Planet Foster is something out of the realms of fantasy. It is indeed. One man's fantasy. It remains an inordinate pity that many gullible readers consider Planet Foster a reality, and swallow the entire package, rather than sifting the thin grain of truth from the dross in his stubbornly ignorant diatribes. Everyone else seems to have had their say on the FFA’s resumption of the New Zealand Knights’ franchise, so what the hell. Here goes. It was always a little anomalous to have a New Zealand side in the A-League, especially considering that the Kingz experiment in the old NSL was not exactly a stunning success. But given Australia’s move into Asia, it was particularly strange. Even if the Knights had won the minor premiership or the A-League proper last season, they were, it now appears, ineligible for Asian club competition. The mistakes have been many, both on and off the pitch. John Adshead’s implicit belief that aged plodders from the lower tiers of English football could cut it in the A-League was quickly proved false last term; we were regularly informed that the Knights had altered their philosophy for the current season, and yet one of the first players signed was Scot Gemmill – the archetypal English league journeyman. In any case, the Knights’ player roster this season has been a horrible mishmash, with short-term contracts flying around like confetti and no perceptible continuity. Injuries have not helped in this regard, it’s true. But it is scarcely a coincidence that the Knights’ two best players this season have been Che Bunce and Noah Hickey…two locals. Mark Paston has been in tremendous form of late as well. Given the odd premise of a club team (a) supposedly representing an entire nation and (b) taking part in another country’s competition, surely it was vital for there to be a significant local presence in the team. Not only for the sake of team spirit and sense of purpose, not only for the sake of football development in New Zealand, but so that the fans could identify with the team more closely. And yet promising youngsters like Kris Bright, Jeremy Brockie, Jeremy Christie and Cole Tinkler were blithely jettisoned after season one. Third-rate British imports like Darren Bazeley and Sean Devine, on the other hand, remained. As the Romario experiment crumbles embarrassingly, one has to wonder whether anyone will make a public statement expressing some equivocation over the guest player issue. Sunday's Adelaide v. New Zealand game followed a predictable pattern. Nathan Burns once again forced over to the right, where he is not remotely as effective; Romario taking up permanent residence in the middle, occasionally laying off neat passes but never striving to beat his man; and, last but not least, Adelaide's attacking players regularly getting into promising positions but hesitating pitifully, torn between the obvious attempt at goal and the possibility of playing in Mr. 986. It was agonizing to watch. Suffice to say that once Romario and Ross Aloisi (how does this man command such a regular starting place?) had been replaced, Adelaide were simply transformed, and played some marvellous football in the final fifteen minutes. And now, we hear, Romario is up to some of his old tricks, doing a runner from the stadium before the final whistle, and going AWOL from training. And yet all and sundry continue to sing the praises of the Romario guest stint, when it has so obviously been a disaster in many respects. Andy Harper, amusingly, went to some lengths during the first half at Hindmarsh to excoriate those who had cast doubt on the value of the visit; yet after the game, in his brief interview with Carl Veart, he timidly asked whether the team cohesion had improved once Romario had departed the field. Veart, however, kept to the party line (and, in fairness, you could hardly expect him to do otherwise). We continue to hear about the tremendous exposure Romario's visit has given the A-League internationally, most recently from John Kosmina. Frankly, apart from coverage of Adelaide's games on Brazilian TV, there has been very little evidence of this. Romario has not, in fact, played all that badly. But he has disrupted the balance of the team, and his presence has put his fellow attackers in two minds in the final third all too often. Will the next club thinking of undertaking a guest signing please take a moment to consider Adelaide's current situation. They are paying an exorbitant amount of money (yes, some of it is covered by sponsorship, I know) for the privilege of slipping behind in the league at a crucial stage of the season, in the hope of building their brand. In the long term, will it have been worth it? The egregious Jack has been let off the hook with a warning, which was not exactly unexpected. But, in a political sense, has he gotten off scot-free? Perhaps not. An interesting side-effect of the Asia-Oceania détente has been that CONCACAF’s “half” team will now be forced to play off against a South American nation, rather than the Asian No. 5, as was the case in the last cycle. This is a blow to Warner’s confederation, and more particularly to nations like his own Trinidad and Tobago, who may find themselves facing Colombia or Uruguay rather than Bahrain in the 2010 playoffs. CONCACAF have recently been pushing for four full places at the World Cup (which would be sheer absurdity, given their lack of depth), so the result of the allocation deliberations could be seen as a double blow for Warner and his confederation. Yes, the idiotic 18-game system for South American World Cup qualifying will continue. But at least FIFA have had the sense to strictly limit the qualifiers to double-headers, so as to ease the burden on the players. Why is it not possible to simply play the South American qualifiers in two five-team groups with a playoff between the two third-placed teams? Are they that desperate for gate takings from international matches? The “defending the autonomy of sport” rhetoric at the beginning of the report is surely, at least in part, a veiled reference to Sepp Blatter’s plans to introduce a mandatory limit on foreign players in national leagues. Currently, EU freedom of labour laws make Blatter’s laudable aim (yes, I’m on his side on this one) somewhat problematic – some might say downright impossible. It’s only the latest episode in the ongoing war between FIFA and the powerful (rapacious?) group of European clubs known as the G14. The reference here is to the litmus case of Abdelmajid Oulmers (on which more in a future piece), the outcome of which could prove devastating for international football, and, by extension, FIFA. And just an update on the Asia-Oceania question, by the way: it seems the opposition to Australia's presence in the AFC is becoming quite overt. No surprise, either, that it's the West Asians who are complaining. Particularly cynical and pathetic is the claim that Australia's move has adversely affected the development of New Zealand and the Pacific nations. A free spot in all the major tournaments besides the World Cup? Not as important as having a big brother in the confederation to regularly rack up cricket scores, apparently. And if the OFC nations are genuinely angry about it, then they should simply follow Australia's lead. The Oceania confederation is an anachronism, pure and simple. FIFA’s recent declaration of the World Cup allocations for 2010 contains one particularly interesting feature, which is mentioned almost as an aside, but is in fact a significant departure from past practice. Cross-confederation qualifiers before the final two-leg playoffs? FIFA has refused to countenance this in the recent past. The ideal solution to the bickering over the four playoff “halves” in the previous cycle would have been to stage a “repechage”-style playoff on neutral territory, but FIFA wasn’t interested. Now, we will have an Oceania interloper taking part in a group stage of the AFC qualifiers. The good news is that it would appear to be the first step towards a full Asia-Oceania merger. Hearty applause from me, since that ridiculous excrescence known as the Oceania confederation no longer has the slightest reason to exist. And perhaps, just perhaps, we now have a partial answer to that still puzzling question of why the Asians were prepared to admit Australia into their confederation, when those big boys from down under were so likely to do their traditional glamour teams out of a World Cup spot. Could it be that an agreement was struck with FIFA to make sure the Oceania cannon fodder would be grouped with Asia, rather than the other “half-spot” confederations (South America and CONCACAF)? That way, the Asians may have felt that they were guaranteed five places, even if one of them might henceforth go to Australia. Now that’s pure speculation on my part, but the ease with which Australia entered the AFC is still a significant head-scratcher as far as I’m concerned. We have assuredly not heard the whole story of those negotiations. In the meantime, the Kiwis will be quietly chortling, given that they now have the chance (assuming they knock over the Pacific minnows) to take part in a proper World Cup qualifying series. Such an opportunity was never vouchsafed Australia during our Oceania days. In the next exciting episode: sundry other talking points arising from the FIFA press release, including the latest in the ongoing Jack Warner saga. Stay tuned. Big news on the international front overnight, with FIFA's executive committee producing a significant press release following their two-day meeting in Switzerland. Most significant of all, of course, is the information pertinent to the forthcoming World Cup cycle. There are a number of surprises, some pleasant, some not boding quite so well. The allocation of places will be the same as for 2006, i.e. Europe: 13; Africa: 5; Asia and Oceania: 5 (4.5 + 0.5; play-off); South America and CONCACAF: 8 (4.5 + 3.5; play-off); hosts (South Africa): 1. Yes, it's the same as 2006, numerically. But not in practical terms. Europe's allocation of 14 was counted as thirteen qualifiers plus the German hosts (holders, of course, are denied automatic entry to the tournament, a mean-spirited and cynical initiative on FIFA's part which was designed to open up more places for the third world confederations). It has been traditional in the past for host continents to have a slightly larger allocation than normal. But to pretend that Europe's "normal" allocation is 13, and that things have simply returned to quits with South Africa hosting the 2010 tournament, is utterly disingenuous. Europe's allocation for 2002, let it be remembered, was effectively fourteen and a half places (champions France qualified automatically, admittedly). Out of those fourteen and a half, incidentally, nine progressed to the second round of the main competition. In 2006, it was ten out of fourteen who did so. How can a confederation with that sort of record endure an effective loss of one and a half places? In my series of posts on the possible allocations for 2010, I imagined that South America might be the unlucky bunch. However, they have managed to maintain their 4.5 allocation (which, incidentally, they fully deserve). Hosting rights for South Africa inevitably meant that the CAF would make some gains, despite their dismal showing in Germany. But they will now be allotted six places at the event - one and a half more than the South Americans. This, too, defies footballing logic. However that, folks, is only the tip of the iceberg. Much more to come, including the bizarre case of the Oceania-Asia "semi-merger". Those football intellectuals, Messrs. Murray and Foster, have been working themselves into a masturbatory frenzy over the Brazilian contingent in the A-League of late. As usual, there's plenty of misrepresentation and inappropriate criticism in the midst of the wide-eyed romanticism. Shane Davis of Australian Football Review, the best independent football analyst in the country for my money, pointed to a recent article by the always perceptive Tim Vickery as an antidote to Foster's starry-eyed, out-of-date take on Brazilian football. Tell a modern-day Brazilian coach that "football is about the ball, not the effort", and you'd never get into his team. One aspect of Foster's article that is particularly ironic is his criticism of the lone striker approach. Of course, on this point I completely agree with him, and believe that the dogged persistence in using one man up front has been a blight on the Socceroos for quite some time. In Gosford on Sunday, too, two sides with lone strikers and packed midfields cancelled each other out, and the result was not pleasing to the eye. At a time when tactical trends mean packed midfields and caution before flamboyance, it is the Brazils and Barcelonas of the world that keep the flame of attacking football alive. Does the man actually watch any football at all? Does he know, for instance, that Barcelona's recent dip in form has been largely attributed to their use of Eidur Gudjohnsen in a lone striker role, which suited the injured Samuel Eto'o down to the ground, but is alien to Gudjohnsen, a "second striker" if ever there was one? Does he remember that Brazil's limp exit from the World Cup coincided with their decision to pack their midfield, which was already starved of genuine width, while leaving...erm...a lone striker up front? The supreme irony, however, is that Foster has long worshipped at the altar of Saint Guus, and sees the Dutchman's general approach as an unimpeachable template upon which to build the future of Australian football. How did Hiddink's Australia typically set out their stall at the World Cup? You guessed it. With a packed midfield, and...a lone striker. Even against a ten-man Italy. In yesterday's piece I told the tale of a cynical beat-up in a Central Coast newspaper, spurred by a single piece of infantile bragging on a myspace page. I regret to report that there was an unfortunate sequel to the story, which probably resulted in a far greater police presence than was necessary at the game. This will stray a little beyond the usual subject matter of this blog, but I feel there is sufficient reason. A Covite friend of mine, with whom I regularly play football informally, was accosted by police on his way out of the ground. In an incident witnessed by several fans of both clubs, my acquaintance was twice slammed hard into a fence and then thrown to the ground...as the result of a typically harmless piece of terrace wit. I can assure readers that the gentleman in question is not by any means a violent type, and merely a concerted and popular member of the Cove chorus. He is currently bruised and sore, but - happily - not injured. The worst aspect of the event, from my point of view, was that the police who accosted him were members of a Counter-Terrorist Unit based in Sydney. Clearly not all the blame should be laid at the door of Mr. Richard Noone, the journalist who produced the despicable article in question and fibbed so as to acquire a photo of stadium events management "in discussions" with police. The original myspace warrior needs to be made aware of the result of his antics, and the police would be well advised to react with a little more caution and intelligence to such reports in the future. Was the massive police presence at Bluetongue Stadium yesterday a result of the original investigation into the myspace prank, or was it increased as a result of the front-page article (and the inevitable chain of events such a piece of scaremongering can produce)? Was it really necessary for the Cove to be escorted all the way around the ground, and for a bottleneck to be created thereby, when on five previous meetings between the two teams, there have been no problems with both groups exiting via the same gate at roughly the same time? Central Coast Express Advocate, please learn your lesson. Boy oh boy, the football refusers in the media have been busy of late. The latest and most absurd incident involves a story in the local Central Coast rag suggesting that "riot police" would need to be on hand for this evening's Central Coast v. Sydney game. As I have observed previously, the relationship between the Cove and the Marinators is, in fact, one of the friendliest in the A-League. The spur for this story, amusingly enough, was a brag by a 15-year-old Mariners supporter on his myspace page (which has since been deleted, apparently), that his "firm" would be ambushing Sydney FC supporters after the game at Gosford Station. The group in question, according to a Marinator friend of mine, didn't even know this particular keyboard warrior. As a source of information upon which to build a newspaper article, in other words, it ranked somewhere beneath pathetic. Yet Richard Noone (an appropriate surname if ever there was one) saw fit to publish his piece of alarmist nonsense, even, according to my Marinator source, inducing the Mariners' event manager Kathy Robinson to pose with police for a photo shoot, without informing her of its purpose. And the eventual "story", believe it or not, made the front page of the Express Advocate. The whole sorry tale has also been related on a new Mariners blog. The lengths to which some journalists will go to beat up the slightest suggestion of soccer-related violence just beggars belief. But wait, there's more. The Melbourne Herald-Sun recently published an interview with the FFA's new CEO, Ben Buckley, who, of course, has a background in AFL. There seem to be no links available as yet, sadly. The interviewer was Mike Sheehan, an AFL hack. Basically, Buckley was assailed with accusations of betrayal and hypocrisy throughout, the implication being that football was necessarily the enemy of AFL in Victoria and elsewhere. Just imagine the situation reversed; would an interview where the subject was bitterly accused of betraying football for AFL make it past the sub-editor's desk? Of course not. Finally, there's a typically sly dig from Peter Fitzsimons, the SMH's former rugby international turned columnist. In mentioning Fabio Cannavaro's European Player of the Year award, he comforts readers with the observation that "I had never heard of him either". That's fine, Pete. In the real world, about a hundred times more people have heard of him than have heard of Andrew Johns. At what point will media proprietors, and their editorial staff, actually refuse to publish the sort of childish anti-football snipes that would not be tolerated if directed against any other major sport? Three losses on the spin for Adelaide United then, and the prospect of missing out on the top four, unthinkable just a month or so ago, is now undeniable. And it's useless to blame it all on Romario, who actually played far better last night. Critics of Adelaide's high-profile acquisition might instead point to the absence of Nathan Burns from his familiar striking role, which has undoubtedly been detrimental to Adelaide's play over the last few games. Last night, he looked badly misplaced on the right-hand side. John Kosmina's side did, however, dominate for long periods at Hindmarsh. The first fifteen minutes of the second half were one-way traffic, with Matthew Kemp, having his best game in the A-League, making a number of penetrating runs down the left, and occasionally providing a useful cross. He was aided in this by Ernie Merrick's puzzling (to put it politely) decision to use Adrian Caceres, a left-winger, as his right-back. Yet there was no-one to properly take advantage, and Adelaide's well-known propensity to defend dangerously high allowed Melbourne to score not one, but two straightforward goals on the break. One thing that struck me particularly about Adelaide's effort last night was this. Bobby Petta was still struggling with injury. Jason Spagnuolo was suspended. Travis Dodd made way for Daniel Beltrame after Robert Bajic's moment of insanity. Lucas Pantelis, of course, is out for the season. That's Adelaide's four best wingers all absent. And yet for much of the game thereafter, they still made plenty of progress down the flanks, thanks to Kemp and the industrious Richie Alagich. No other team in the A-League possesses Adelaide's depth out wide. Sadly, it is not matched by effective play in the centre. Kosmina's persistence with Ross Aloisi simply defies common sense. Angelo Costanzo, whenever called upon to occupy the midfield anchor role, has been superb. The option of Aloisi's long, flat, outside-of-the-foot free kicks is not sufficient to justify his inclusion, in my opinion. Carl Veart, a striker masquerading as an attacking midfielder, has certainly been impressive at times this season, but can he do the job as effectively as Fernando Rech could? My memories of Rech's early days in the NSL, at the Brisbane Strikers, are all of him providing the powering runs and clever through-balls from midfield rather than striving manfully at the pointy end as he is currently doing. Adelaide have an enviable array of talented wingers, a potentially excellent strikeforce, and a capable if sometimes guileless defence. But they are suffering from a hollow core at present.